This Sunday, Dec. 18th is your last chance in 2017 to shop the bounty of the Lake Forest Park Farmers Market and the ever-popular Holiday Crafts Fair! The special December farmers market will feature so many of your favorite regular season vendors and plenty of options for yummy, fresh, and locally grown and raised produce, meats, fish, and more. Come visit all your farming friends from Garden Treasures, RP Guerrero, Well Fed Farms, Hidden River, and more. Check in with Lopez Vineyard, Middle Fork Roasters, and Shen Zen Tea to bolster your beverage supplies. Say hey to the folks at Blue Cottage Jams, Beekeeper’s Secret, and Pete’s Perfect Toffee to satisfy that sweet tooth. And be sure to stop by Wilson Fish for the last catch of the year! You never know what delights you’ll discover at the Lake Forest Park Farmers Market, but you know you’ll end up with a basket full of goodies. So be sure to come armed with your whole shopping list and plan to leave with your holiday dinner fixings well in hand. But before you go, head down to the Third Place Commons Holiday Crafts Fair to explore the many wonderful creations of over 30 gifted Washington crafters and artisans. In a fair jam-packed with handcrafted goodies of every kind, every size, and every price point, you’re sure to find the perfect gifts for everyone on your list (maybe even yourself). Need a few final stocking stuffers? Need eight nights of fabulous Hanukkah delights? Need one dazzling show-stopper gift for that special someone? Whatever you’re looking for, the Crafts Fair will have it. Crafts Fair vendors will offer up a jubilant array of handcrafted jewelry, watches, pens, home décor, toys, and holiday novelties. From fine arts to fabric arts and wearables to potions, lotions, and notions, the phrase “something for everyone” just might have been invented for this occasion! 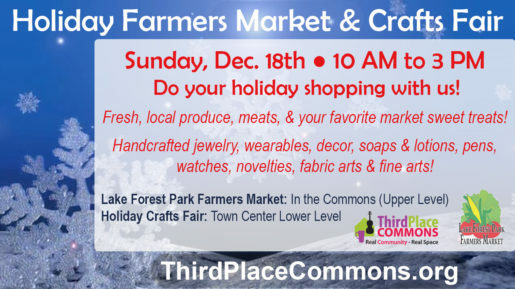 Due to the cold weather, the December farmers market will take place inside at Third Place Commons on the upper level of Lake Forest Park Town Center. The Holiday Crafts Fair will take place just downstairs in the lower lobby of Town Center. Both the farmers market and crafts fair will take place from 10am to 3pm. 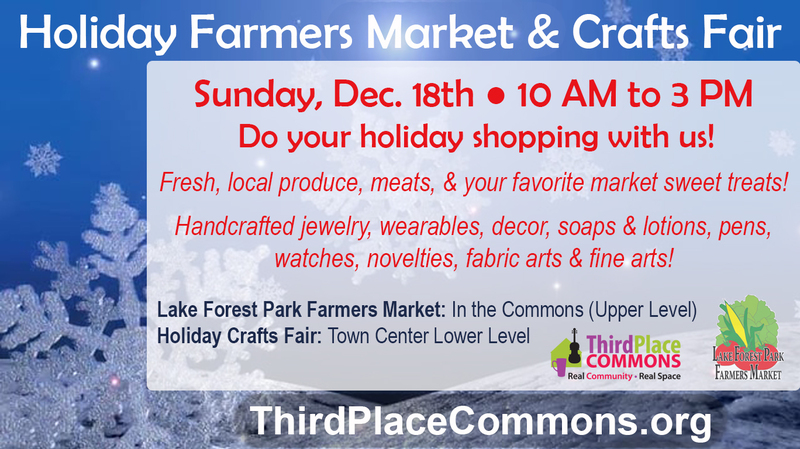 The LFP Farmers Market and Holiday Crafts Fair are presented by Third Place Commons, a community-supported 501(c)3 nonprofit organization dedicated to fostering real community in real space. Third Place Commons is located at 17171 Bothell Way NE, Lake Forest Park, Washington 98155.